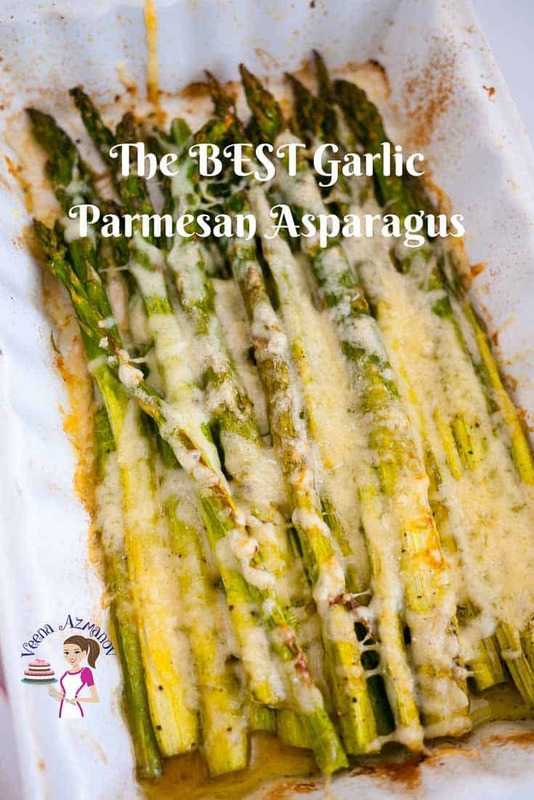 This garlic Parmesan asparagus makes a great appetizer or side dish. Brushed with olive oil and garlic then sprinkled with just the right amount of cheese to keep it luxurious yet healthy. A simple, easy and effortless recipe that gets done in less than 20 minutes. Nothing beats a good appetizer or side dish. 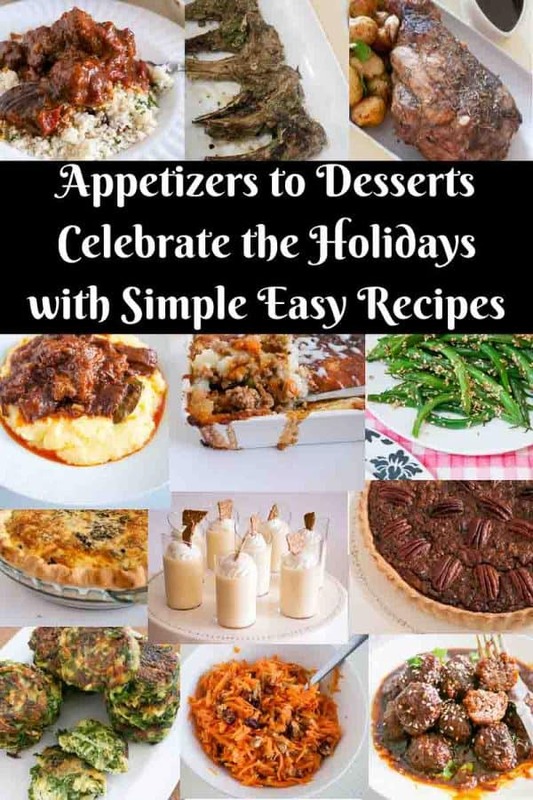 In our home salads, sides and appetizers are more popular than any main course. 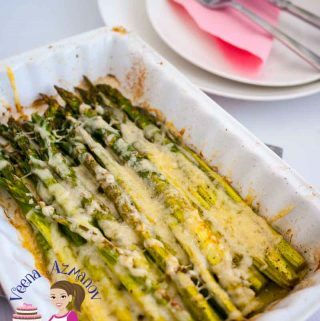 The kids love eating these veggies with just a smear of cheese and baked until tender. Though the cheese is not much the flavor it adds to the dish is huge. 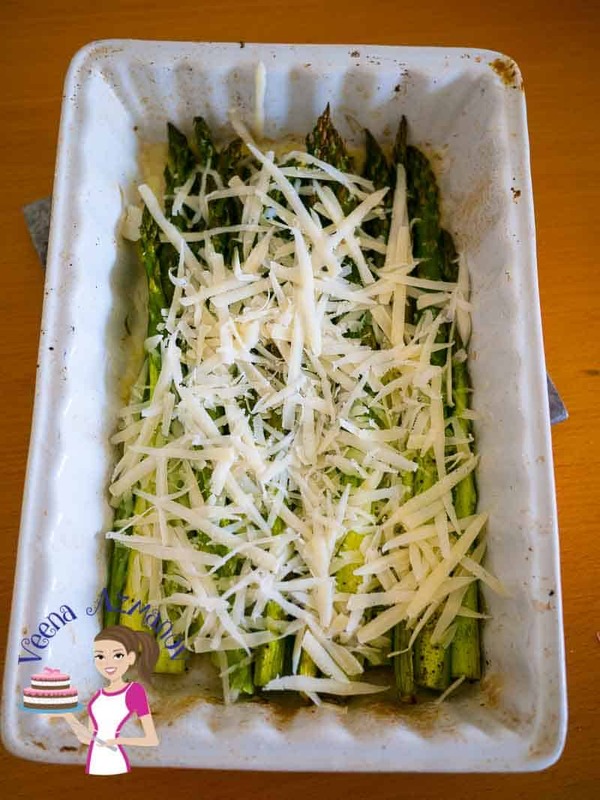 Parmesan in particular really pairs well with asparagus. Not to mention baking does well to veggies in general. This is really a no fuss recipe and made often in our home because it’s much healthier. My kids aren’t really open to eating asparagus on their own. They do enjoy beans and broccoli without any cheese but somehow we need help with asparagus. In this case, the cheese does the trick and sometimes just a sprinkle of sesame does wonderfully like my Sesame Asparagus. The Cheese in this recipe is not a whole lot. You don’t need a ton of cheese on veggies! But the three tables adds so much of flavor and takes a simple vegetable dish to comfort food height. 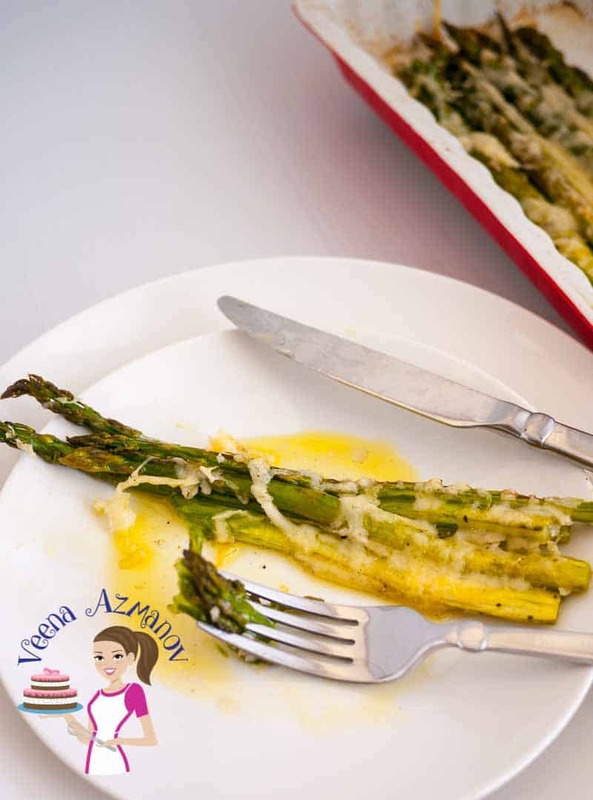 The asparagus is cooked until tender so a mouthful just melts in your mouth. 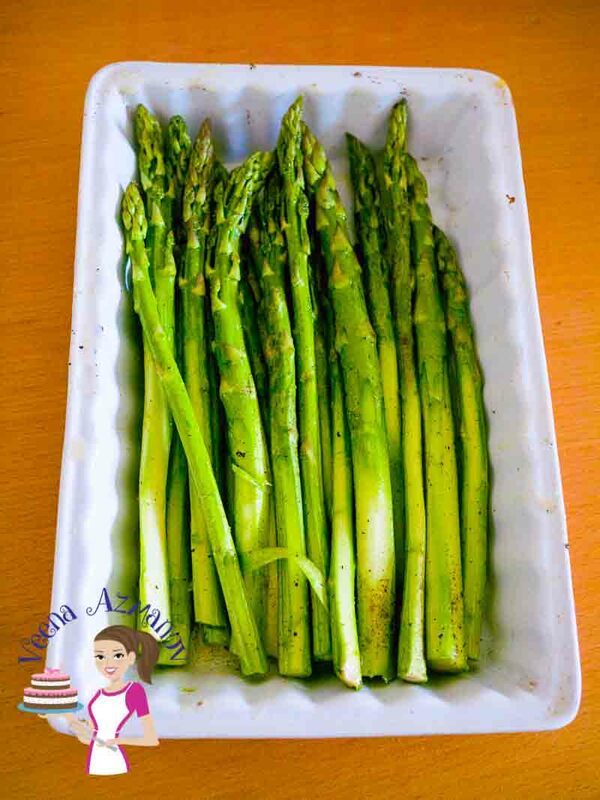 Asparagus – Always look for fresh asparagus with bright green color. The stalk needs to be tender not too woody. The bottom woody part that needs to be trimmed should usually be not more than 3 inches. That way you get a good long tender stem. 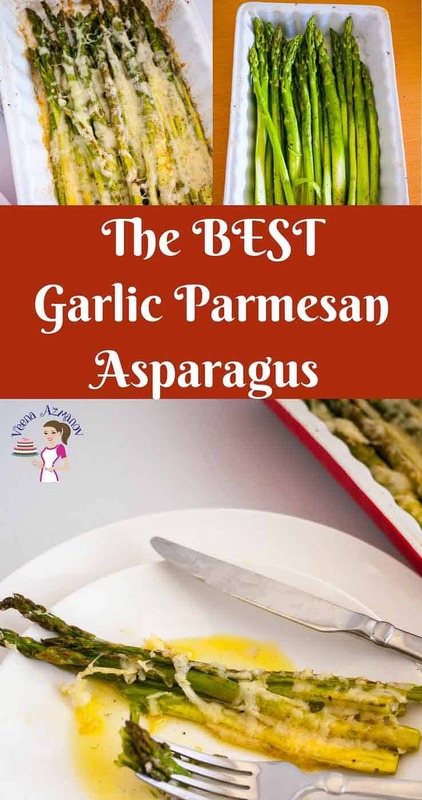 Garlic – Here I have used fresh garlic but often I use roasted garlic which really adds a ton of flavor. Lemon juice – A little goes a long way but really helps bring out the flavor. Cheese – Just a tbsp of Parmesan can add a nice nutty and salty flavor. 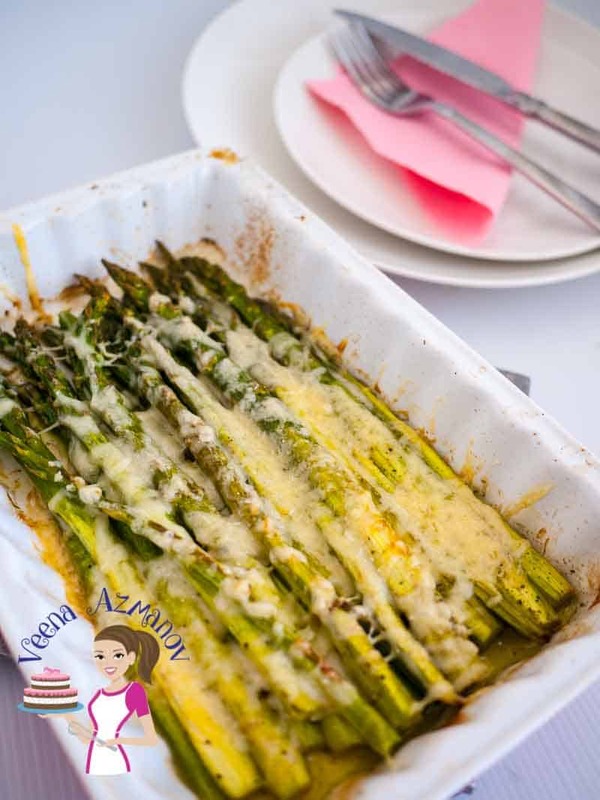 The cheddar just adds that little-melted cheese on top that makes this asparagus more inviting. 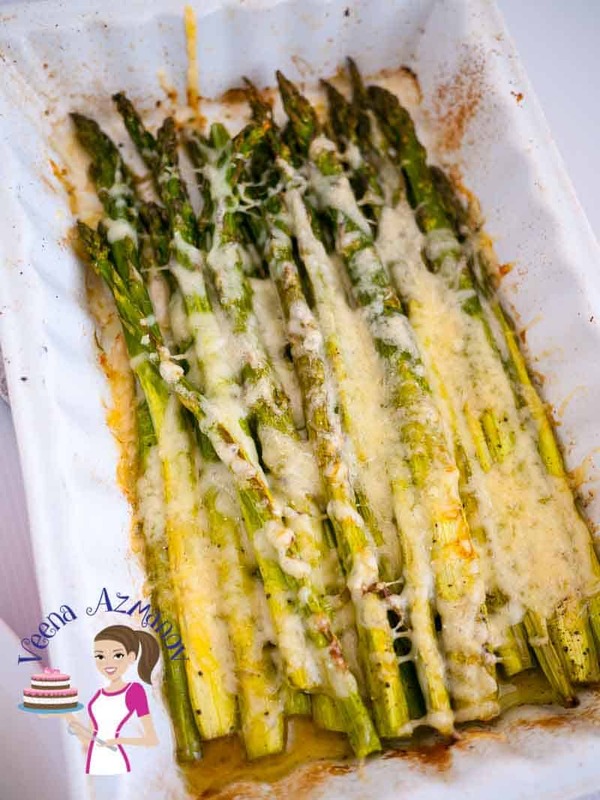 Notice that the cheese is not much and yet it looks like a lot because it’s grated fresh over the asparagus. In a small bowl mix together the olive oil, minced garlic, lemon juice, salt and pepper. Brush each asparagus with the olive oil mixture. In a small bowl mix together the olive oil, minced garlic, lemon juice, salt, and pepper. Just made this recipe today. Was the best I ever tasted. That cheddar really does make a huge difference. Thank you so much for the recipe. Haven’t had asparagus before. I love garlic and Parmesan cheese so I’m guessing I would love this dish. Oh you must try asparagus. Once cooked it’s really tender and absolutely delicious. Yum! What’s not to love about garlic and parmesan on anything! And I especially love asparagus. I second that statement – what’s not to love about garlic and parmesan on anything.! Always a winner. Look at all that glorious cheese! Definitely trying this recipe for our favorite veggie! I love asparagus and usually steam or roast it. I’ve also sprinkled with parmesan cheese, but never cheddar. Will have to try your recipe. I love baking and sauteed the best.. Have still not tried steaming. Cheddar adds a nice cream and mild cheese flavor.